‘Tis the Season to Find Your Happy Place! As we kick off yet another work week, I’m doing all I can to hold on to the feeling of calm I managed to capture by extending the 4th of July into a mini-vacation. I hope someday someone will be able to put a scientific rationale behind that old saying “time flies when you’re having fun.” Until that happens, I offer an important reminder about a crucial component to keeping your health and fitness routine in check: don’t underestimate the importance of taking care of your mind. With the dog days of summer upon us, there’s no time like the present to take a look at your schedule and figure out how to pencil in some time to re-charge and re-boot. For me, it meant extending the holiday into a few extra days away from the office and escaping to one of my favorite places on the planet: Jones Beach. I admit, I didn’t use these precious beach days as an excuse to be a total slug. Instead, I used the sun-soaked backdrop as a different venue for my workouts. I traded my 30-minute elliptical session for 50-minute power walks and followed those steps with plank, squat and/or push-up Tabatas on the sand. (Other no-gym-equipment-required exercises for beach Tabatas include burpees, squat thrusts or mountain climbers.) After breaking a sweat, I was more than happy to cool off in the crisp Atlantic Ocean. I realize a true getaway may not be in the cards for everyone this summer. However, whatever time you can take for yourself – whether it’s an afternoon, morning or evening of tuning out – do it! Whatever you do, make sure you totally disconnect at some point during the week. I mean get off the iPhone or Blackberry, don’t worry about uploading a photo to Facebook or tweeting about the healthy snack you just ate. Just chill! Use the longer days as a reason to enjoy some time outside in the evening with family or friends. Take a walk, have dinner out on your deck or bring a picnic to the park. So, while I’m constantly motivating people to move more, I’m now challenging you to find a way to slow down a bit. Then let me know how you sneak some down time into your schedule. If we don’t take advantage of these “lazy days of summer,” we may miss the perfect opportunity to make mental health breaks part of our everyday journey to have fun, be fit and feel fabulous! 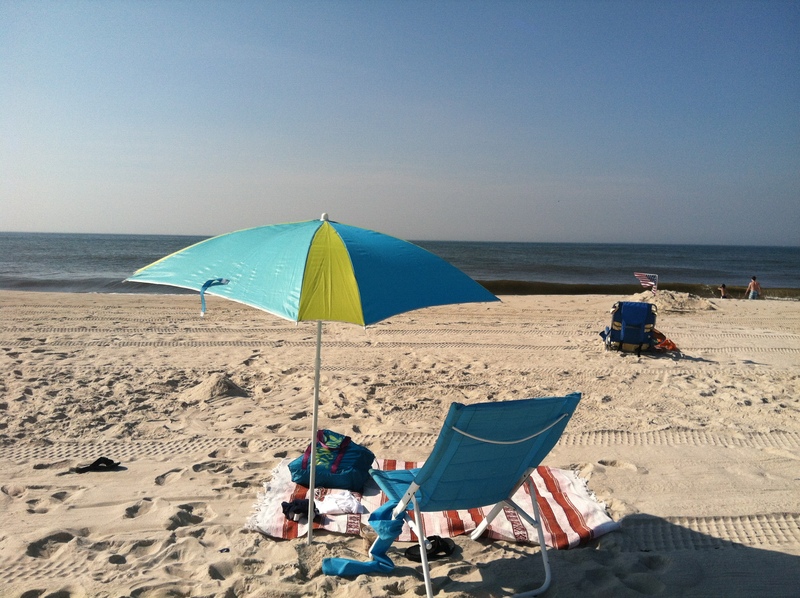 Posted on July 9, 2012, in Fitness, Health, Vacation and tagged Atlantic Ocean, Beach Workouts, Burpees, Jones Beach, Laura DeAngelis, Mental Health & Fitness, Tabata Training. Bookmark the permalink. Leave a comment.